To reach Horanadu from Sringeri you need to go via Kudremukha. If you love driving, then you would definitely want the roads to be as good as in Kudremukha. Great roads amidst greenary makes the drive memorable. Soon after Kudremukha, you will be greeted by tea estates on your way to Kalasa. Horanadu is half an hour journey from Kalasa. We had planned first to go to Horanadu then visit Kalasa temple, on our way back to Mangalore. As it was a holiday season, the temple was full of devotess from all over Karnataka. We went in queue for darshanam of Goddess Annapoorneshwari. Temple surroundings are filled with greenary. Coconut and arecanut palms form the backdrop of the temple. After the darshanam, we had the food in Bhojana Shaala of the temple. After this, when we started towards Kalasa, it was 3 15 in the afternoon. When we reached Kalasa, it was 3 45 pm. 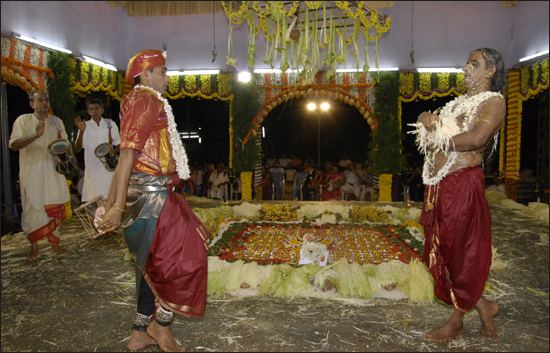 Kalasa is located in Mudigere Taluk of Chikmagalur district and is the abode of Lord Kalaseshwara. This place is also known as Dakshin Kashi. Using the stairs, if you go towards the temple, first you will find storeyed building, much similar to the houses in Malnad. After moving to the right of this building, you will find Kalaseshwara Temple. Usually, people who visit Malnad, visit Sringeri, Horanadu and Kalasa temples in a single day. So, we could identify the faces, we saw in Sringeri and Horanadu. After the darshanam of Lord Kalaseshwara, when we started towards Mangalore, it was 4 30 pm. On our way back, in Kudremukha, we could spot a rainbow. Perfect picture in a perfect place. My plan when coming back was to go to Hanumana Gundi falls(Soothanabbi falls), which is 22 meters in height and is in Kudremukha National Park. But when we reached the place, it was closed as the entry timings are from morning 9 to evening 4 30 and it was already 6. These days, Kodyadka or Hosanadu (which is 7 km from Alangar in Dakshina Kannada in Moodabidare - Karkala highway) is becoming famous for Hosanadu Annapoorneshwari Temple. We decided to visit the shrine. Hosanadu temple was built by a localite when he got inspired, after frequent visits to Horanadu, to build a similar temple in his native. At the temple entrance, you will see, 63 feet Lord Hanuman statue, holding the mountain containing Sanjeevini herbs. When you move further towards the temple, you will find a beautiful garden. Garbhagudi of the temple is a replica of Horanadu temple. Devotees are offered meals after the night pooja. One more thing worth mentioning here is that, priests do not accept any dakshina(money offerings) from devotees. When we reached Mangalore, after visiting Hosanadu - that ended our 2 day pilgrimage trip to temples in coastal and Malnad Karnataka. Thanks anonymous. In fact Shringeri is one my favorite places to visit.